We start our Saturday mornings off in the store by baking fresh cinnamon rolls- they are light and luscious and the smell of fresh bread and cinnamon awakens all our senses! I wish you were here to take in the aroma. For this recipe you will need measuring spoons and cups,a 9X13 baking pan, a rolling pin,a sifter or fine mesh strainer, a mixer with dough hook or a strong arm! Grease and flour a 9"x13" baking pan and set aside. In the bowl of a stand up mixer with a dough hook, place the first four ingredients. and stir until dissolved. * To yield ½ an egg, break one into a bowl and whisk with a fork. Pour out half into a separate bowl and add your second egg to the bowl . (Save the remaining ½ egg to add to the scrambled eggs you’re going to make for the cook!) Make certain the water is hot enough to completely dissolve the butter. Add 2 Cups of flour and beat. Add 1 Cup of flour and the yeast and combine. Add the remaining 2 Cups of flour and knead for 3-4 minutes with the dough hook- or by hand 4-5 minutes. NOTE: this dough is very soft and sticky. Flour your counter and pour the dough out on floured surface.. Sprinkle the top of the dough lightly with more flour and gently shape into a ball. Roll the dough out to 14"x18" rectangle. Spread the dough with 2 Tbsp. softened butter. Combine the cinnamon and sugar in a small bowl and sprinkle the dough with the mixture. Roll up the dough to form a tight log. Cut the dough in ½ and then cut each ½ into 6 equals pieces. Place the rolls, cut side up in a greased and floured baking pan. Let rise 20-30 minutes. While rolls are rising preheat oven to 350. Combine butter, cream cheese and sift in confectioner’s sugar. Add the vanilla and set aside. Bake the rolls at 350 for 18-20 minutes. Watch the tops to make certain you do not over bake them. Remove from oven and let cool 15 minutes. 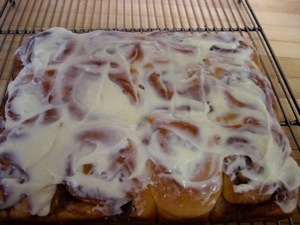 Serve as is or top with icing- you will only need 1/2 the recipe for a batch of rolls- freeze the rest for next Saturday! Here’s hoping you kitchen smells as great as ours. Posted on April 25, 2009 by Loree Ogan.